How to draft an Accounting Assistant Curriculum Vitae that will impress? How to grab your futures employers’ attention when you are applying for a new job as Accounting Assistant? 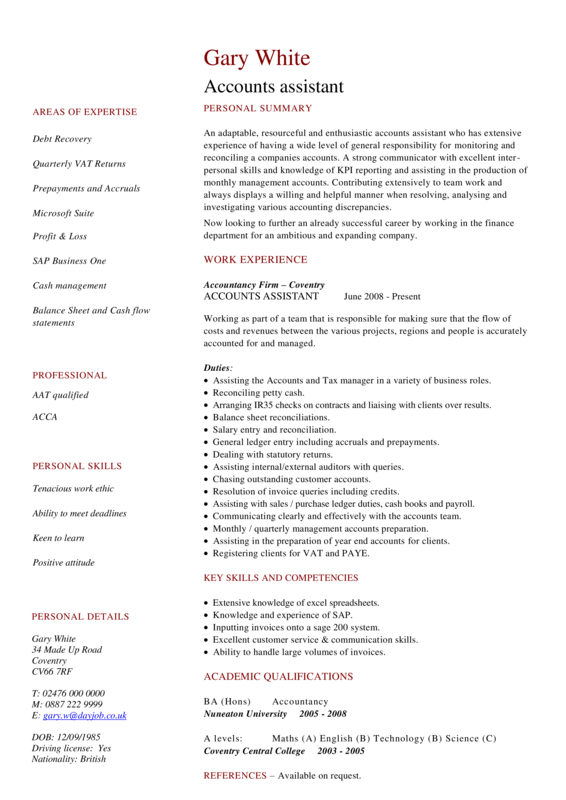 Download this Accounting Assistant CV template now! This Accounting Assistant CV template will grab your future employer its attention. After downloading and filling in the blanks, you can customize every detail and appearance of your resume and finish. Completing your Accounting Assistant CV has never been easier, and will be finished within in minutes... Download it now! Accounts assistant AREAS OF EXPERTISE Debt Recovery Quarterly VAT Returns Prepayments and Accruals Microsoft Suite PERSONAL SUMMARY An adaptable, resourceful and enthusiastic accounts assistant who has extensive experience of having a wide level of general responsibility for monitoring and reconciling a companies accounts.. SAP Business One WORK EXPERIENCE Cash management Accountancy Firm – Coventry ACCOUNTS ASSISTANT Balance Sheet and Cash flow statements PROFESSIONAL AAT qualified ACCA PERSONAL SKILLS Tenacious work ethic Ability to meet deadlines Keen to learn June 2008 - Present Working as part of a team that is responsible for making sure that the flow of costs and revenues between the various projects, regions, and people is accurately accounted for and managed..